Le label SOLEIL ZEUHL édite depuis 1998 des musiques progressives, Jazz Rock, R.I.O., Zeuhl. Une identité musicale unique en France. 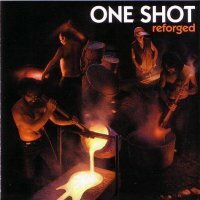 Reissue of the 1st ONE SHOT CD, long out of print. This new issue has been re-mixed by James Mac Gaw & Pierre Luzy & was remastered for better dynamics. It has 1 bonus track, recorded the same day as the album & not featured on the first issue. New cover art too. The band is bassist Philipppe Buissonnet (Magma), keyboardist Emmanuel Borghi, (Magma, Offering, C. Vander trio), guitarist James Mac Gaw (Magma) & drummer Daniel Jeand’heur. The sound is a very appealing combination of Zeuhl mixed with electric Miles (dig the smoky organ & great Fender Rhodes work) with a guitarist who plays in the Patrice Meyer/Scott McGill vein. One Shot are one of the very best fusion bands operating today and the zeuhl flavor makes this even more appealing. REFORGED is a reincarnation of the the very first One Shot album recorded back at the end of 90′s. It’s been re-mixed and re-mastered with a bonus track added from the original 90 minute recording session. The result is an incredibly more wild and raw album than the original filled with the bands most fierce and adventurous playing. The studio sheen from before is gone, replaced with the incredible instrumental rhythmic rumbling thunder and lightning strikes of guitar that creates a man made sonic storm that leaves you plastered against the wall as the last notes fade out. This is One Shot’s definitive musical statement! This is essentially a remastered version of One Shot’s glorious 1999 privately released self-titled debut with one bonus track added. Keyboardist Emmanuel Borghi and bassist Philippe Bussonnet were both members of the then-current lineup of Magma, and are joined by James Mac Gaw and Daniel Jeand’heur on guitar and drums respectively for this intense jazz-rock improv workout that is at once raw, edgy, and totally smokin’. Don’t expect anything that sounds like Magma just because two of the guys are members of that band (…okay, Bussonnet does have that cool bass growl going here and there), but instead this bears far more resemblance to some early 70s over-the-top American shred-fusion like Billy Cobham, Return to Forever circa Seventh Galaxy, or electric Miles Davis just to name a few references. Borghi loves that Fender Rhodes, and so do I – it’s all over this disc, along with Jeand’heur’s blistering solo fret-flights, and the band as a whole is exceptionally tight. Occasionally they wind it down a bit into some relaxed and cerebral introspective playfulness, but for the most part this is a high energy workout that will leave you pretty much breathless beginning to end. The remastering has only made this great set even better, and the bonus track (apparently from the same 2/99 sessions that produced the original album) is icing on the cake. For fans of that 70s American fusion sound, One Shot’s debut is essential listening. Peter Thelen for EXPOSE mag.